Type 2. 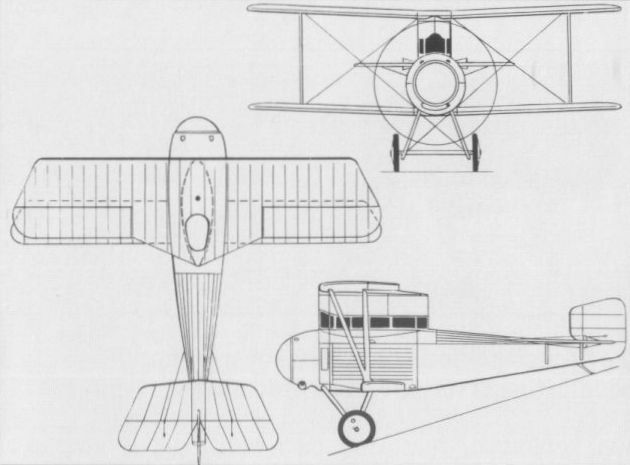 The uncompleted Sage Type I of 1916 was a twin-engined bomber with nose, upper and floor guns; the Type 2 of the same year was a two-seat single-engined fighter, the design of which represented one of many attempts to surmount the difficulties which persisted until gun synchronizing gears became available. 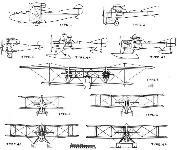 They were, in fact, already becoming available as the aircraft was constructed. The layout adopted resembled one that had been schemed by the Short company, the gunner standing largely in a faired superstructure between the fuselage and top wing, the upper surface of which was cut away to permit the use of a Lewis gun. The pilot, who was unarmed, sat, wholly enclosed, at the forward end of the superstructure. The Sage No. 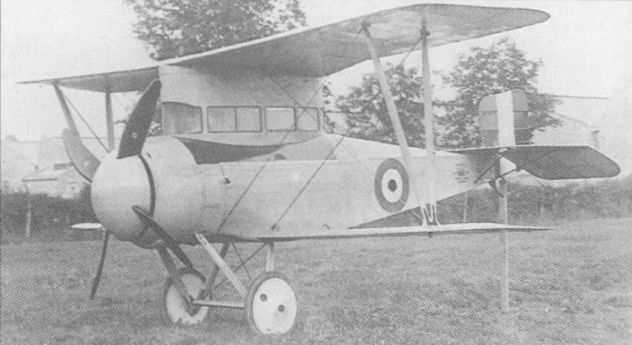 2 Two-seater fighter was designed in the spring of 1916. The pilots and observers seats are enclosed in a Streamline cabin reaching to the upper plane, the top plane being left open so as to enable the observer to use a Lewis gun in a ring mounting on the top plane, for firing over the propeller. Name or type No. of machine Scout. Purpose for which Intended Fighting. Span 32 ft. 2 1/2 In. Sap, maximum and minimum 5 ft. 6 in. Overall length 21 ft. 1 5/8 In. Maximum height 9 ft. 6 in. lower plane 2 ft. 8 in. Total surface of wings 168 sq. ft.
Span of tail 9 ft. 5 In. Total area of tail 20 sq. ft.
Area of elevators 14.5 sq. ft.
Area of rudder 9 sq. ft.
Area of each aileron 12 1/2 sq. ft.
Total area of ailerons 25 sq. ft. Maximum cross section of body 3 ft. 5 in. dia. Horizontal area of body 44 sq. ft.
Vertical area of body 52.5 sq. ft.
Engine type and h.p. 100 h.p. Gnome. Airscrew diameter and pitch 8 ft. d. x 7 ft. p.
Weight of machine empty 890 lbs. Load per sq. ft. 9.2 lbs. Weight per h.p. 15.46 lbs. Tank capacity in hours 2 1/2 hours. Tank capacity in gallons 26 gallons. Speed low down 112 m.p.h. Speed at 10,000 feet 100 m.p.h. To 5,000 feet 6 1/2 minutes. To 10,000 feet 14 3/4 minutes. Disposable load apart from fuel 96 lbs. Total weight of machine loaded 1546 lbs. 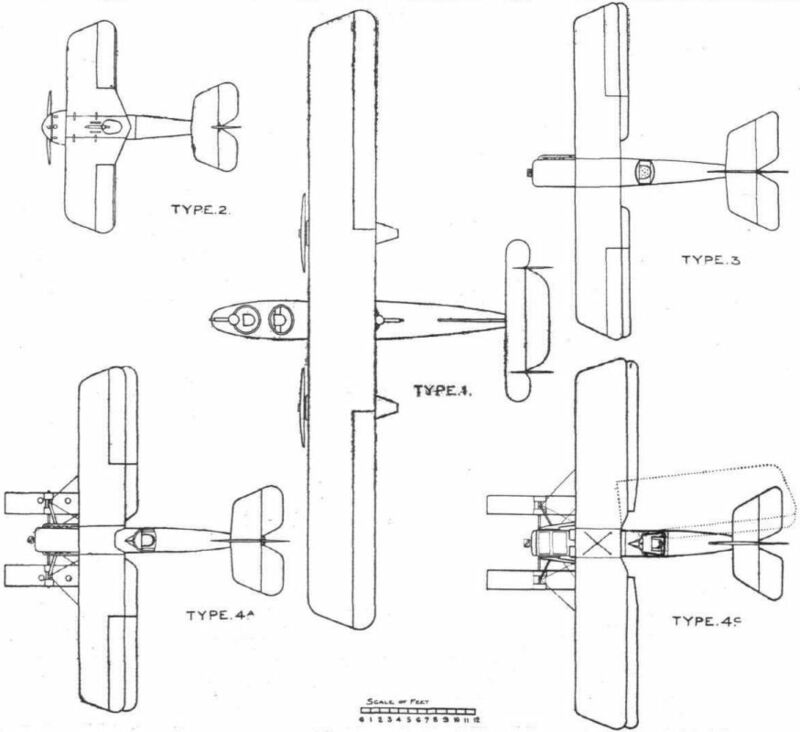 Designed by Clifford W Tinson for Frederick Sage & Company, the Type 2 two-seat fighting scout was of original concept. Considerable care was taken to reduce aerodynamic drag, the 100 hp Gnome Monosoupape nine-cylinder rotary engine being fully cowled, a large propeller spinner being provided and the crew being accommodated in a fully-glazed cabin. 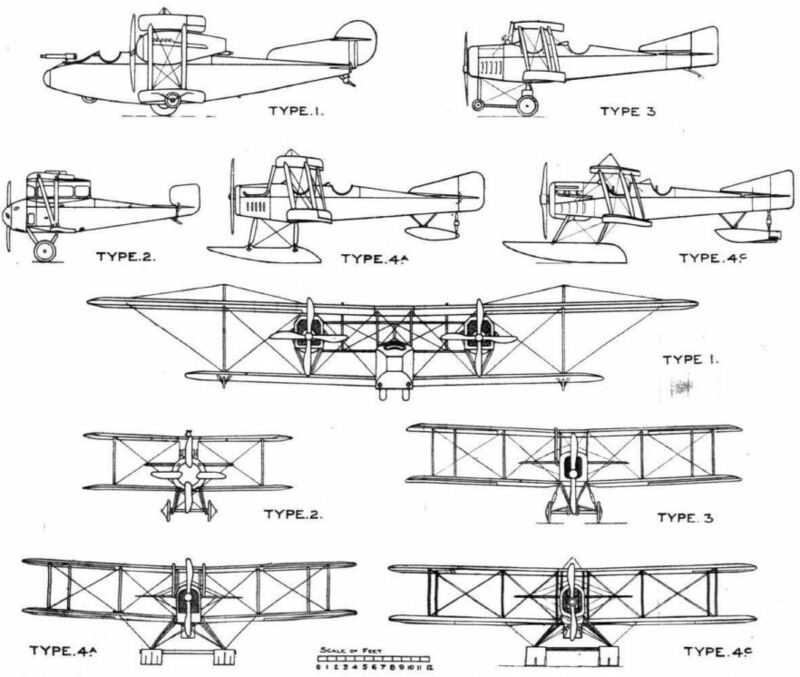 Of conventional wire-braced wooden construction, the Type 2 was a single-bay biplane with considerable gap, the upper wing being supported by the cabin structure and having an aperture above the observer’s seat. When standing to fire his 0.303-in (7,7-mm) machine gun, the observer had a wide and clear field of fire. Remarkably small, the Type 2 had rod-activated ailerons in the upper wing only. 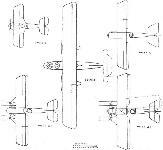 First flown on 10 August 1916, it proved to possess a very good performance, but gun synchronization had meanwhile become available, and after the sole prototype had been wrecked in a forced landing on 20 September 1916, no attempt was made to rebuild the aircraft or develop it. Max speed, 112 mph (180 km/h) at sea level. Time to 10,000 ft (3 050 m), 14.75 min. Loaded weight, 1,546 lb (701 kg). Span, 22 ft 2 1/2 in (6,77 m). Length, 21 ft 1 5/8 in (6,45 m). Height, 9 ft 6 in (2,89 m). Wing area, 168 sq ft (15,61 m2). Before synchronised gun-gears became generally adopted the tractor type of machine was of comparatively little use as a fighter, in spite of its inherent advantage over the pusher type as regards performance. In order to overcome the difficulty the Sage Type 2 was designed. As already mentioned, when this machine was first conceived, the synchronized gun had not become generally accepted, there being at the time, not unnaturally, a certain doubt as to the feasibility of devising a mechanism which would prevent the gun from being fired while a screw blade was in line with it. We say not unnaturally because on the face of it the problem of designing such a gear is a serious one, considering the speed of revolution of the screw and the rate of firing of the gun. However, at the time Sage No. 2 was conceived this problem was still being tackled, and so instead of experimenting with gun gears this firm turned their attention to the design of a machine which should mount its gun in such a position as to provide a free field of fire. 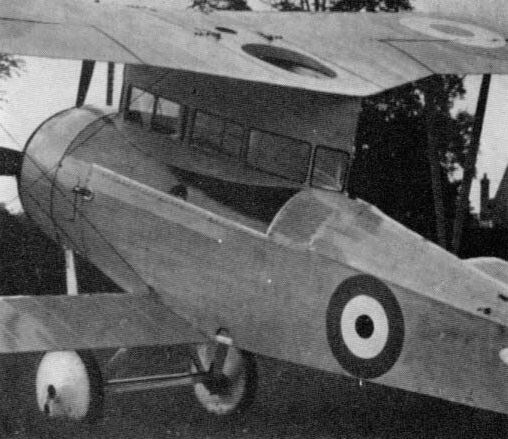 It may be remembered that quite early in the War the French Nieuport firm produced a little two-seater in which the observer could stand upright with his head and shoulders projecting through a circular opening in the top plane. This was more or less the type adopted by the designer of Sage No. 2, but realizing the discomfort caused to the gunner by standing upright in the slipstream of the propeller, and the effect this draught would have on the gunner's sighting, provisions were made for sheltering the gunner inside an enclosed cabin. How this was accomplished will be seen from the accompanying illustrations. The Type 2 is a small machine, and may be said to belong to the scout class as regards dimensions, although it is designed as a two-seater. The upper plane is of greater span and chord than is the bottom one, and the inter-plane struts are of the Vee type, with but one pair on each side. The top plane, it will be seen, has its centre section mounted on and forming the roof of a streamline structure enclosing the heads and shoulders of pilot and gunner. When standing up in his cockpit the gunner can just see over the top of the top plane, where his gun is mounted. He thus has an uninterrupted field of vision extending through the whole of an upper hemisphere. It will no doubt have been noticed that the gap of the Sage Type 2 appears to be greater than is called for by aerodynamical reasons. This is occasioned by the desire on the part of the designer to provide the gunner with a free field in a forward direction also. This - without some form of synchronised gear - was only possible by placing the gun so high that it would fire over the tips of the propeller. It is interesting to note that in spite of the large amounts of side area presented by this cabin the machine was, we are informed, quite easy to handle and appeared to be reasonably stable. During a trial flight the rudder post gave way, with the result that the machine became unmanageable and in landing it crashed into a tree with somewhat serious results to its wings. It was not, we think, perpetuated, probably because by then the synchronised gun-gears had been found to work well in practice. 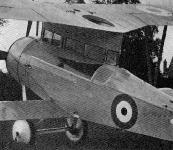 Very short wings and fully enclosed cockpits were featured by the two-seat Sage 2. Three-quarter View from Rear - Sage No.2 (100 h.p. Mono Gnome engine). Solution to the problem of attaining a wide field of fire: Sage Type 2, in which the gunner stood to wield his gun through a hole. TWO VIEWS OF THE SAGE TYPE 2: In the photograph showing the machine uncovered the gunner may be seen standing up taking aim with a machine gun. Side and front elevations of the Sage machines. Plan views of the Sage machines.